Wearing your baby has many benefits, for both parent and child. But babywearing is also hard work! As a core fitness specialist, I’ve noticed a blind spot in the questions I receive from mothers who want to tone up their tummies. 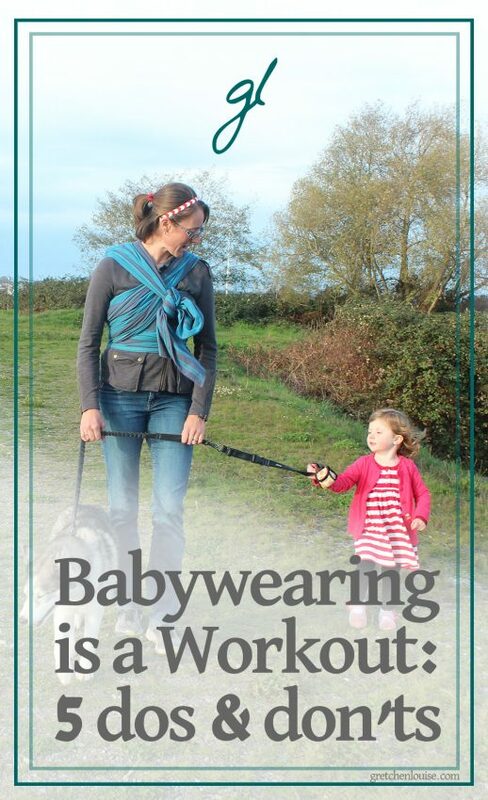 They recognize that babywearing can be done while working out, but they don’t see babywearing as a workout. The reality from a biomechanical and physiological standpoint is that strapping your child to your body can either help or harm your whole body. In this article, I use my expertise as a core fitffitness specialist to outline 5 great things to do and 5 not-so-great things to do when you are wearing your baby. 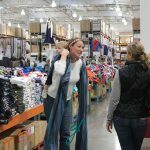 Because while we are so careful to choose the best type of carrier for our babies’ needs, we also need to be thinking about how our babywearing methods will affect our alignment, our pelvic floors (PF), our feet, and our diastasi recti (DR, abdominal separations which most women have after giving birth). We mums are so quick to lay ourselves down on the altar of what’s best for our babies. But if any baby-care method breaks us down to the point of widening our DR, worsening our prolapse and leaking issues, increasing our neck and back pain — and all of that contributes to self-worth issues and further self-neglect — then where does that leave us? Yes, mama, there is a connection! And there is a solution that doesn’t involve giving up keeping your baby or toddler close. 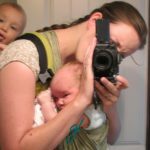 First let me spell out some things you can do to ensure your babywearing methods and carrier choice are helping you rather than hurting you. Then we’ll talk about five things you should avoid so you can prevent future problems. 1. 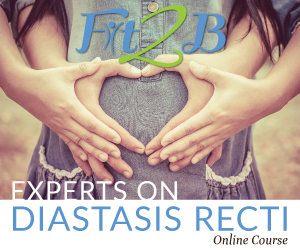 Check your tummy for a diastasis recti (DR) with these free videos here on Fit2B. If you have one that is deep and larger than 2 fingerwidths wide, be sure to use a carrier that supports and wraps your abs or at the very least one that does not put any of baby’s weight directly on your belly. If you have a DR then the next section of 5 things to avoid becomes more crucial. 2. View your babywearing time as work for your body. It takes extra energy to carry that extra weight, even if it’s close to your center. So be sure to balance that work. Take breaks to stretch and unwind. If you are using a side carrier, switch sides frequently so that you don’t overdevelop your strength on one side and contribute to lifelong imbalances. Be sure to stretch and move all your tired muscles after you’ve removed your little one. 3. Practice good alignment no matter your activities. Whether you’re wearing your baby, nursing your baby, or sitting at the desk paying bills, practice good alignment. Stand and sit tall rather than hunching, tucking your bum under, or over-arching your lower back. Create pillow spaces between your vertebral spine bones. Move like a queen, because you are! 4. Stabilize your core with a exhale that engages your transverse abdominus. Before loading your baby onto your body, engage your TA with a core breath. Take a few more stabilizing breaths after you are done with a babywearing session. If you have no idea what I just said, watch this free 10-minute “Totally Transverse” standing abs routine here. You’ll catch on quickly as it improves how your back feels! 5. Use caution when exploring workouts you can do while your baby is attached to your body. Motherhood is already a workout! If you have extra energy for more movement, and you want to do it safely while babywearing, be sure to exercise in a manner that will not damage any core trauma you are healing from. 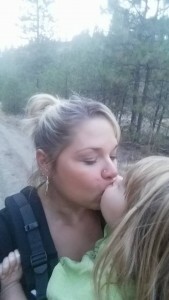 I invite you to check out our “Mommy & Me” routines among all the others Fit2B provides here. 1. Do not fail to see motherhood and babywearing as real work, wear, and tear on your body’s musculoskelatal, cardiovascular, and nervous systems. If you go to the gym and pick up a twenty-five pound weight plate, strap it to your body, and take two laps around the gym’s perimeter with it, we call that “part of your workout”. Then, as your trainer, I would tell you to stretch afterward, as well as do other exercises to counter-balance that move and activate your opposing muscles groups. If you wear your baby all day but then fail to stretch and counter-balance that work by deliberately using other muscles, you are asking for chronic overuse injuries! You carried your little one inside of you, but now your baby is bigger and constantly growing. 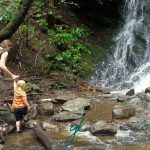 If you want a long, healthy babywearing experience, you need to be proactive in order to avoid injury. 2. Do not let your wrap, sling, or other baby carrier pull you out of good alignment. If you catch yourself swaying your lower back, holding a hip with one hand, jutting your head forward, thrusting your chest out, or hitching your weight to one side all the time while you’re babywearing, then your carrier isn’t on correctly or isn’t the right one for your body. A good babywearing device will support both you and your baby, in positions of proper alignment for each of you. A good baby carrier will minimize the work your body has to do to keep your baby close. 3. Do not try to do insane workouts with your baby attached to your body. This should be a no-brainer, but you wouldn’t believe the stories I’ve heard. Doing jumping jacks with your baby in a wrap just really isn’t a good idea. While there are videos on YouTube of mamas pole dancing or doing other crazy things with their toddlers on their back, please just don’t do it. One slip of a sweaty palm could spell a tragic accident. Your baby’s safety should always be your primary concern while babywearing, but it is especially important to consider baby’s safety when planning your babywearing workout routines. Fit2B has several “Mommy & Me” routines in our Fit2B New Moms section that are safe for your core and your baby. 4. Do not babywear for more than 1 hour at a time if you are dealing with severe diastasis recti and/or pelvic floor trauma. This member of Fit2B is splinting while she babywears because she is dealing with hernia as well as diastasis recti. The splint supports her core so those issues don’t worsen. This is a hard rule for moms. While there are some core experts out there who recommend absolutey no babywearing while you’re in the initial six to eight weeks of healing from childbirth, that just doesn’t work in reality. But Kelly Dean, core rehabilitation specialist at The Tummy Team, suggests that you keep your babywearing to a maximum of one hour at a time while your body is recovering. It is very important for you to recognize how dramatically your your healing will be slowed down if you fail to take a break from the work of wearing your baby. When you pause to stretch and realign your posture, focus on the goal of restoring your body so that you can be healthy in the long term, big picture of motherhood. 5. Do not force babywearing. If snugging your baby tightly is overstimulating or injurious to you or your baby, acknowledge the issue and figure it out, instead of forcing yourself or your baby to make it work. My daughter loved being held, touched, and snuggled, and couldn’t fall asleep without her hand on me even as a newborn. She loved being packed around and would nurse to sleep until she was twenty-seven months old. My son, on the other hand, wanted to eat as soon as he woke up, and then wanted to be laid down to sleep. I was so confused! I’d put him in a carrier and he would pitch a fit. When he’s mad, he wants space, but he comes running to me for snuggles many other times throughout the day. Babywearing isn’t a must for motherhood; don’t force it if it’s not comfortable for you or your baby. You and your baby have a unique relationship, unlike that of any other mother and child. The wrap that works for your best girlfriend might push on your tummy wrong. Your baby might hate the carrier that’s most comfortable for you. That’s okay. And the sling your baby loves to snuggle in might be a style that keeps your DR open a bit longer. But that’s okay, too. If babywearing is the only way to get things done, do it. Just do it well. 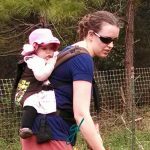 We do what works as moms, and we recognize that babywearing is “work”, perhaps even some of our best work. 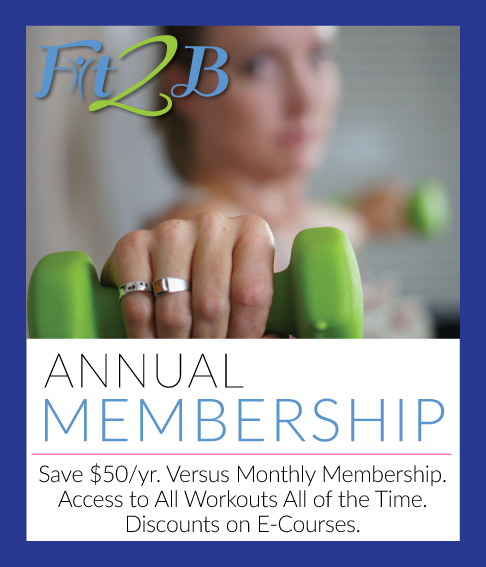 Bethany Learn is the CEO and founder of Fit2B Studio, an home fitness portal at fit2b.com with members worldwide that provides unlimited access to 100+ wholesome workouts for the whole family. Her family-friendly focus keeps things modest, safe and fun for all ages. She is passionate about standing in the gap for those who have been led to believe that they will always look pregnant or will always leak when exercising. 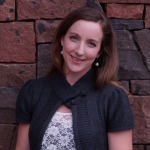 In her free time, she enjoys teaching pilates and yoga for a local studio, reading historical fiction, crocheting, race-walking with her team, and foraging for wild food. 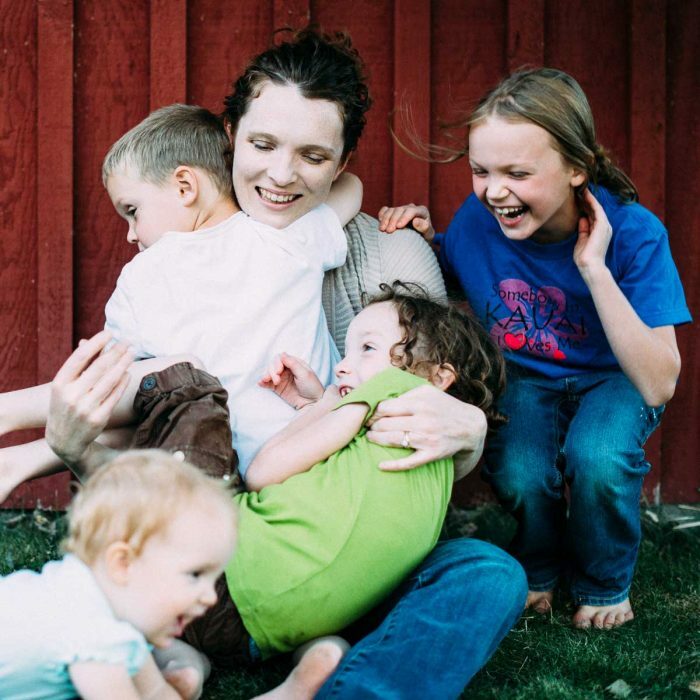 Bethany lives with her husband and two children on a 7-acre farm in the Pacific Northwest with all their goats, chickens, dogs, horses, and barn cats. Babywearing Mama Photos Courtesy of Fit2B Moms. Babywearing Mama with Dog & Toddler Courtesy of Fit2B Mom Rachel Zupke. i thought of another dont that i never see in lists like this: dont put on the carrier around your stomach. put it on down around your hips instead… this avoids putting pressure on your stomach directly, instead putting it across something that can handle it: bone. i found that im much less likely to get a sore, worn out pelvic floor when i keep that thing down on my hips. 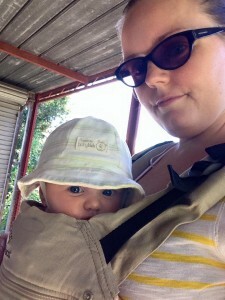 is it ok to be sweating while baby wearing? i am trying to workout while wearing my newborn and he is up against my sweat. there are alot of things online about working out and babywearing but nothing of the actual sweating part that goes along with it! is it okay that i am sweating on him? is he getting too hot although he seems content? any info on this! thanks. Yes, it’s totally fine. Let’s be honest, we get sweaty babywearing at all – let alone when we are working out! – cuz those little babies are big heaters! When I would sweat a bunch in a workout while babywearing, I’d tuck a washcloth between my chest and theirs to give a bit more distance between us (never between my chest and their face). If I sensed they were getting uncomfortable, I’d take a break or do a non-babywearing move (like cat/cow yoga poses with baby on the floor beneath my face). Does that answer your question? If not, please clarify and I’ll happily respond again! Thanks for writing this! I would really benefit from a post with pictures demonstrating common carriers with suggestions showing specifically how to make them more tummy safe. I picked up some good hints from the article but still feel confused about whether I should avoid my SSC in front carries or ring sling. Thank you so much for sharing these reminders with us, Bethany! 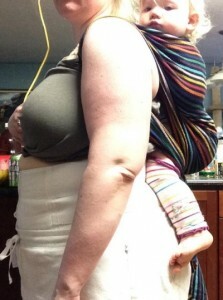 I know I neglect to view my babywearing as a workout, but it is that, for sure. And I don’t even think about how as such I need to stretch and prepare for babywearing, just like another workout. So appreciate your wisdom!